On behalf of the Board of Directors of Roxy-Pacific, it is my pleasure to present to you the Annual Report for the full year ended December 31, 2017 (“FY2017”). FY2017 represented a challenging yet fulfilling year for us at Roxy-Pacific. Globally, there had been many arduous global challenges that took its impact on businesses worldwide, following political events like rising tensions within the Korean Peninsula, China’s slowing economic growth and easing GDP, and increasingly volatile global stock market. Closer to home, on the residential property front, the slowdown took a turn for the better towards the second half of 2017, signaling a turnaround for the sector. For the whole of 2017, private residential property prices rose 1.1%, reversing from a 3.1% decline in the previous year. We continue to rebalance our property portfolio geographically and by business mix, strengthening our recurring income streams through our hospitality pillar and property investments, to complement our core property development business. Notably, with the gradual pick-up of the Singapore residential property market, we returned to our ‘roots’, with a renewed focus on our core market where we have deep familiarity. We will continue to be on the lookout for land banks selectively, amidst opportunities presented by the recovering market. For FY2017, we achieved revenue of S$246.8 million, a 36% decrease from S$385.4 million recorded in preceding financial year (“FY2016”), mainly due to the absence of Property Development revenue recognised on completion of projects in 2016 and early 2017 including Whitehaven, Jade Residences, LIV on Wilkie and LIV on Sophia. The decrease in revenue was mitigated by higher revenue recognised from Trilive, with residential units 100% sold and one remaining unsold commercial unit. It is noteworthy that although our projects in Australia and Malaysia had made good progress on sales and construction, revenue from these projects can only be recognised upon completion1, unlike projects in Singapore that record revenue progressively. Additionally, the Group’s total attributable pre-sale revenue remains strong at S$459.4 million, with profits from the Singapore residential projects to be progressively recognised from 1Q2018 to FY2020. This also comprises profits from our Australian residential projects that can only be recognised upon completion – we expect to recognise the profits from The Hensley in FY2018 and that from Glebe and Octavia in FY2019. During the year, we saw a 43% increase in other operating income in FY2017 to S$32.8 million from S$23.0 million in FY2016, lifted mainly by the higher fair value gain on investment property recorded for 59 Goulburn Street in Australia. However, due mainly to lower revenue coupled with higher other operating expenses relating to impairment on long-term loan to an associate in Australia, FY2017 net profit decreased 41% to S$29.4 million in FY2017 from S$49.8 million in FY2016. Nonetheless, we are pleased to have made good progress in the recycling of funds from the successful divestment of 59 Goulburn Street into other yield-accretive property investments, namely, the acquisitions of Grade A commercial towers at 205 Queen Street and NZI Centre in Auckland – marking our maiden foray into New Zealand. Like what we’ve done with 59 Goulburn Street, we’re exploring a possible divestment of our 117 Clarence Street office building in Sydney. While it is contributing healthy recurring income, we want to capitalise on the favourable market cycle to unlock value and maximise the yield on our investment. We are still deliberating options and will update shareholders at an appropriate time should there be material developments. At the same time, we are back actively in the Singapore residential market, building our land bank with the gradual uptick in the property sector. We will continue to look for opportunities to suitably recycle our capital for enhancement of shareholder value. We will continually seek an optimal mix between our three segments – Property Development, Property Investment and Hotel Ownership – and balance our assets portfolio both geographically and across sectors for sustainable growth. Our strategy is supported by our strong balance sheet, with cash and cash equivalents of S$234.4 million, a comfortable net debt-to-adjusted Net Asset Value ratio of 0.55 time notwithstanding the completion of acquisition of properties in Japan, New Zealand and Singapore in FY2017, and good headroom from our S$500 million Multicurrency Debt Issuance programme, of which S$60 million has been issued to date. We have repurchased S$19.5 million of the issued debt in 2017 and also set aside another S$40.5 million to fully pay down the balance in FY2018, and this should improve our gearing levels. The Urban Redevelopment Authority (“URA”) reported that private residential property prices in 4Q2017 rose 0.8%, continuing the 0.7% growth in 3Q20172, signaling a turnaround for the sector. For the whole of 2017, prices rose 1.1% compared to the 3.1% decline in the previous year2. In a recent Bloomberg survey, Singapore home prices were projected to increase about 5.5% in 20183. The URA data also showed that developers sold 10,566 units last year, a 32.5% increase compared to 7,972 units sold in 20162. The number of units sold also outweighs the 6,020 units launched in 20172. Our decision to progressively accumulate predominantly freehold sites at attractive prices over the last two years, amidst the property downturn, has proven to be a prudent move. We are now able to tap the opportunities presented by the buoyant property market in 2018 with our impending launches. The Navian, which was officially launched for sale on January 28, 2018 received strong reception, having sold 23 units as of February 5, 2018. Comprising 48 units, the six-storey freehold residential development is within close proximity of amenities such as the Singapore Post Centre, Paya Lebar Square and Tanjong Katong Shopping Centre, and is well connected to major roads and expressways. In all, we have accumulated ten development sites in Singapore of which Derby Court at Derbyshire Road, Wilshire at Farrer Road and the Kismis sites in the prime Upper Bukit Timah estates were acquired after year end. Of the ten sites, we plan to launch for sale six projects comprising a total of 440 units in FY2018. In view of the expected pick-up in prices and sales volumes, we are well placed to leverage on this turnaround in the Singapore residential property market. Apart from The Navian, other developments sites located at Upper Bukit Timah Road, Grange Road, Guillemard Lane, Pasir Panjang and River Valley will also be launched. These projects are expected to contribute positively to the Group’s earnings progressively from 1Q2019. To ride on the turnaround of the residential sector, we’ll monitor market conditions closely and also consider the possible launch of the Dunearn and the Derbyshire sites in the coming year. Although priority will be to successfully sell and deliver the units from our current land bank, we will continue to selectively replenish our land bank, with a greater focus on unique development sites, ensuring sustainable long-term growth for the Company. In Australia, residential property prices rose 8.3% during the 12-month period between September 2016 and September 2017, led by year-on-year growth registered in Sydney and Melbourne of 9.4% and 13.2%, respectively4. The Group’s wholly-owned residential development projects in Sydney have done well. The Hensley and Octavia are substantially sold each with only two remaining unsold units, while the Glebe project, which was launched in two phases, is nearly 70% sold as of February 5, 2018. Our 40%-owned luxury condominium project in Brisbane, New World Tower, has received healthy reception and is 63% sold as of February 5, 2018. In Malaysia, The Colony by Wisma Infinitum is close to 70% sold as at February 5, 2018, having found a niche in the form of compact dual key configurations that are efficiently designed. Phase Two of our Malaysian freehold JV project, The Luxe by Wisma Infinitum, which is strategically located in the Kuala Lumpur City Centre and is positioned higher than The Colony to target a different market segment, is 30% sold as of February 5, 2018. Having accumulated experience overseas, especially in Australia, we will continue to work closely with our strategic partners to deepen our footprint in these favourable markets, while we continue to prudently seek out unique and yield-accretive opportunities in Singapore to replenish our land bank. We will remain focused on project execution in FY2018. As for the Australian office sector, the September quarter recorded the fastest growth in nominal rents of 0.7%5. Property analysts believe the office property sector will continue to provide the best income returns over the next two years, with Victoria recording the best returns of 3.4% and 4.5%, respectively, while New South Wales is projected to achieve 3.3% and 3.8%5. Notably, there is an undersupply of office space in New South Wales over the next one to three years, compared to other states5, boding well for our 50%-owned, 14-storey commercial asset in Sydney’s CBD, 117 Clarence Street, which has achieved full occupancy. In Melbourne, we have acquired a 6-storey office building located at 312 St Kilda Road, minutes from Melbourne’s CBD. This 45%-owned property enjoys a high occupancy of 92% as at January 31, 2018 and contributes strong recurring rental income to the Group. We are also acquiring a freehold, 6-storey commercial and retail building in the prime retail area in the centre of Melbourne’s CBD, in close proximity to Melbourne’s General Post Office, Bourke Street Mall and the cosmopolitan Hardware Lane. We expect to complete the acquisition on March 1, 2018 and intend to redevelop this wholly-owned property into a hotel with a retail component on the ground or basement levels. Our acquisition of the 50%-owned property comprising two Grade A commercial towers of 17 storeys and 22 storeys at 205 Queen Street, Auckland, New Zealand, marked our maiden entry into this market. Situated in the core of Auckland’s CBD, this property presents a prime investment opportunity for us and has the potential to be a stable source of rental income for the Group. We see opportunity to capitalise on the upward trending market cycle in New Zealand to raise occupancy from the current 93% to 100% in the near future to maximise rental yield. With our in-house management expertise, coupled with our property investment experience gained both locally and in overseas markets, we made a second acquisition in this country to further broaden our recurring income stream. Our wholly-owned 5-storey building, NZI Centre, situated in the western end of Auckland’s CBD, is fully leased to a well-known tenant – IAG New Zealand Limited – the largest insurer in New Zealand. Overall, our strategy for this segment will continue to be on the acquisition of well-located and tenanted commercial buildings which will strengthen our recurring income stream. On the hospitality front, latest statistics from the Singapore Tourism Board (“STB”) showed that Singapore hit a record high in tourist arrivals and spending for the second consecutive year, having received 17.4 million visitors in 2017, exceeding earlier forecasts that had projected 17.0 million visitors for the year. Similarly, tourism receipts rose 3.9% in 2017 to S$26.8 billion. For 2018, the STB expects further growth for the tourism sector, forecasting visitor arrivals to grow 1% to 4% to be in the range of 17.6 million to 18.1 million, while tourism receipts are expected to grow between 1% and 3%. The Grand Mercure Singapore Roxy hotel took impact from subdued corporate activity caused by continued global economic uncertainty in certain sectors such as Offshore and Marine and pricing competition from new hotel supply, with declines in average occupancy rate (“AOR”), average room rate (“ARR”) and revenue per available room (“RevPAR”). With a stronger demand forecast by STB, and fewer new room supply in 2018, we are optimistic that Grand Mercure Singapore Roxy hotel will improve its performance in the coming year. Contrary to Singapore’s subdued tourism outlook, according to the Japanese National Tourism Organisation, Japan received 28,690,932 visitors in 2017 YTD, an increase of 19% year-on-year. In the month of December, Japan saw 2,521,300 visitors, which was a 23% increase year-on-year6. As at YTD June 2017, a total of 8 million visitor nights were spent in Osaka City7. International accommodation guests, which accounts for 36.1% of total accommodation guests, increased by 6.7% year-on-year to 2.9 million, while domestic accommodation guests increased by 2.6% year-on-year to 5.1 million7. Kyoto is estimated to be visited by over 50 million tourists annually, with foreign and Japanese tourists spending an average of ¥100,000 and ¥47,000 per person respectively8. Our first self-managed hotel asset, Noku Kyoto, which was launched in November 2015, recorded healthy AOR, ARR and RevPAR. Noku Kyoto has enjoyed high ARR; with its favourable location adjacent to the Kyoto Imperial Palace and connectivity to the Marutamachi train station, coupled with its unique value proposition through curated tours and personalised services. Given the warm response that we have received since opening and given Kyoto’s resilient tourism prospects, we remain optimistic of its performance in the coming year. Replicating our proven model for the successful, self-managed, upscale boutique Noku Kyoto hotel, we acquired and subsequently rebranded our 154-room hotel in Osaka to Noku Osaka in January 2018. Noku Osaka is an 8-minute walk away from Tenjibashi shopping street – the longest shopping street in Japan – and is within close proximity to tourist hotspots including the Osaka Tenmangu Shrine, Osaka Castle Park, as well as the famous Cherry Blossoms at the Osaka Mint Bureau. Due to its ideal location, Noku Osaka has enjoyed high occupancy since the acquisition. We are self-managing this 9-storey hotel under the Group’s Noku Roxy hospitality management and has repositioned it into another upscale boutique hotel. The self-managed Noku Roxy hospitality brand has most recently been extended to the Kudafunafaru island at Noonu Atoll, Maldives. The upscale resort, which will consist 50 villas on a total land area of 89,896 sqm upon completion, soft opened in December 2017 and will be fully opened in 2018. In line with our intention to hone our hotel management capabilities and strengthen our recurring income streams, we also intend to launch our Noku-branded resort in Phuket, Thailand, by 2019. With a geographically-diversified portfolio, we hope to progressively build a sustainable stream of recurring income for the Hotel Ownership segment. While we intend to self-manage hotel assets where possible, we will also consider collaborating with international hotel operators in managing larger-scale city hotels. For Grand Mercure Roxy Hotel in Singapore, it is self-managed under franchise agreement with Accor Group. Going forward, we will work towards the launch of our pipeline hospitality assets to strengthen our recurring income and deepen our presence in existing markets and new geographical markets to build up our yield-accretive hospitality asset base. To reward our loyal shareholders for their continuous support, the Board has proposed a final cash dividend (one-tier tax exempt) of 0.771 SGD cents. Coupled with the interim dividend (one-tier tax exempt) of 0.214 SGD cents, this brings the total distributions for the financial year to 0.985 SGD cents, representing a dividend payout ratio of 40%. The Board has also on February 28, 2018 proposed a bonus issue on the basis of one bonus share for every ten existing ordinary shares. Apart from giving due recognition to shareholders for their support, the proposed bonus share issue will also serve to increase the Group’s issued share capital base that may in turn increase accessibility to more investors to encourage trading liquidity and participation by investors, thereby broadening the shareholder base. 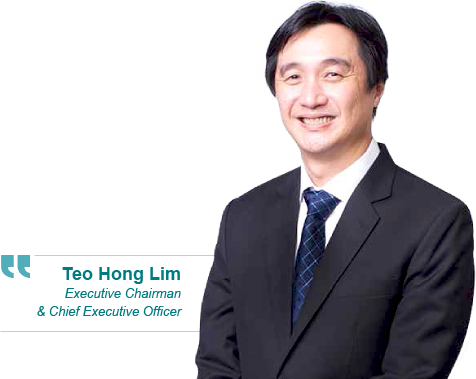 I would like to take this opportunity to thank our Lead Independent Director and Audit Risk Management Committee Chairman, Mr Hew Koon Chan, for his guidance and invaluable contributions over the past 10 years with the Group. I would also like to thank our Board of Directors for their guidance and wise counsel in the last financial year. At the same time, I would also like to take this opportunity to welcome Mr Tong Din Eu, who joined the Board as an Independent Director with effect from October 2, 2017. Mr Tong’s deep experience in corporate finance will be valuable to us. In closing, I would like to thank our management and staff for their dedication and contributions to Roxy-Pacific. Last but not least, I would like to extend our appreciation to our shareholders, clients, consultants, suppliers, partners and business associates for their strong support as we stay primed for a sustainable growth, working closely alongside all of you. 1 For overseas projects, revenue is recognised using completion method. If the Group adopts the percentage of completion method, revenue to be recognised in FY2017 will be S$14.9 million (FY2016: S$15.6 million) for the project in Malaysia and S$112.7 million (FY2016: S$62.5 million) for the projects in Australia.